WE'D ALWAYS NOTICED strange goings-on around a particular house on Sunnynook Drive, but we did nothing. You'd think my LAPD community police training would have me reaching for the phone every time a shadow rustled, but I erred on the side of benefit of the doubt. I didn't report the massive amounts of garbage. Or the grown men sitting on bicycles under trees. Or the Morse code whistling at night. Let this be a lesson. In the last 24 hours, Sunnynook Drive has seen an unusual amount of police activity and neighbor interest. And today I get the scoop from Atwater Village's Director of Animal Welfare. "A notorious drug house in Atwater Village was recently raided by the LAPD. The owner and his partner were arrested; owner is in the hospital, partner is in jail. In addition to drugs and assorted mayhem, the house was of major concern to many neighbors because of the cats who lived there. The house is absolutely filthy (soon to be condemned by Building and Safety), the cats have been neglected and/or abused. "So here's the situation right now: 6-7 cats, several doves, lizards, assorted reptiles and one small dog were confiscated by Animal Control this morning. They are being held as evidence and are not available for adoption by the public or rescue groups at this time. "[Atwater Village DAWs] will be keeping tabs on them; when they become available, we will alert everybody. "There are conflicting reports about kittens - possibly 5-6 kittens were taken by Animal Control yesterday. We do not know if they are being held as evidence or not. "There are still approximately 6-7 cats left at the property. "The property is still occupied so no one should go near it. While the owner and his partner may be gone, there are at least four 'tenants' and a constant parade of visitors. These people are all addicts and/or criminals. "However, the immediate neighbors will assist in trapping the remaining cats. These cats will need foster/permanent homes ASAP! 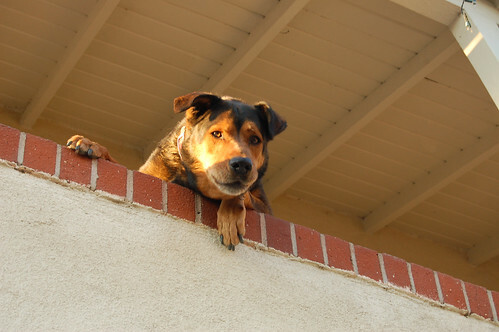 "The Atwater Village DAWs can provide cages and other equipment for anyone who can foster. The cats all appear young, some maybe 6-7 months old, and friendly. They will not be too difficult to place. Please contact me or Jeannie if you can help." Nothing brings out the Joneses like a half-dozen kitties in a meth lab. A FREQUENT NEIGHBORHOOD visitor caught some mid-morning excitement from her vantage point at Starbucks on Glendale Blvd. She reports the old orange rotating 76 ball at the gas station across the street is gone. It has been replaced not, luckily, with one of those new-fangled blister-pack two-dimensional ConocoPhillips signs. But with a new red rotating 76 ball. Principal photography for AmericanEast began in July, 2006. Shooting primarily took place in the Atwater Village neighborhood of Los Angeles, the location of the film's main set - Habibi's Cafe. 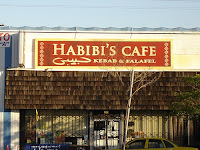 Because much of the story takes place at Habibi's, it would have been impossible to close down a real Middle Eastern restaurant for such an extended period of time, so, instead, the design crew, led by production designer Frank Bollinger, converted a vacant, storefront retail property into a kawha that would look familiar to anyone who ever sipped an Arabic coffee in downtown Cairo. In fact, both the exterior and the interior of the building was so convincing that Atwater Village residents from time to time strode onto the set expecting to order falafels and kebabs. The smoky, hothouse look brought to the set through the lighting and lensing of director of photography Michael Wojciechowski added to the location’s Middle Eastern feel. Ha ha on us. Maybe Shaloub and company can make it up to us by opening an actual falafel joint. Till then, with AmericanEast in the can, we await the film's release date. SOME OF THE LATEST and greatest Internet tidbits concerning our 8,000-resident sliver of Los Angeles, just one of 173 official LA neighborhoods. Conchords Land in Northeast LA? No telling why a New Zealand duo with an HBO show about New York spends so much time in northeast LA. 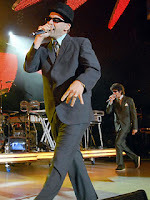 Maybe helping other neighborhood artistes find funnier rhymes for lumps and humps? SHE GETS EMAIL earthquake alerts. She checks the USGS LA quake map. But today was the first time Mrs. Atwater Village Newbie felt a good ol' Southern California shaker - a 3.5 centered near Chatsworth - first hand. She was working 15 miles away in Sherman Oaks when things starting falling off shelves. A few people screamed, and she had to mute a conference call for a few seconds. A few seconds. That's all it was. She was shaken, not stirred. Mr. Newbie, on the other hand, in an office in Glendale, felt nothing. THERE'S A NEW BAR in the hood, adding a fifth wheel to the quadrant of Big Foot Lodge, The Roost, Tam O'Shanter and Club Tee Gee. The Griffin is at 3000 Los Feliz Blvd., where La Estrada used to be. I haven't been, but Thrillist and Yelp already recommend the LA incarnation of this Vegas establishment. Volunteer position description and contact information on the AVNC Forum. Info Session: Aug. 29, 6:00pm, Atwater Village Library, 3379 Glendale Blvd. AVNC Election: Oct. 6, 2007, 9:00am to 4:00pm, Holy Trinity Church, 3716 Boyce Ave.
All 14 seats are open: two each from north, central and south Atwater Village; plus representatives for nonprofits, community groups, businesses, churches, schools and parks. 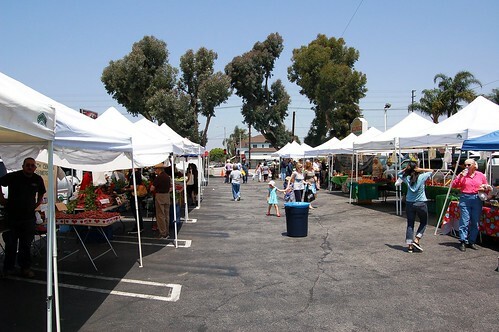 Atwater Village Farmers' Market - 3250 Glendale Blvd. 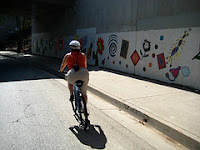 - Atwater Village is a little bit of Iowa thrown into the heart of LA. People stroll slowly up and down the wide, tree-lined sidewalks, window shopping at the brick storefronts. The market is just as wholesome as you'd expect in this little slice of Mayberry, and the crowd looks appropriately wholesome and corn-fed. Surprising to learn that Iowa is now 47.9% Hispanic. Come meet these corn-feeders every Sunday, 10:00am to 2:00pm, in the Wells Fargo bank parking lot. So What's the Second Best? Clean Sweep, originally uploaded by Atwater Village Newbie. 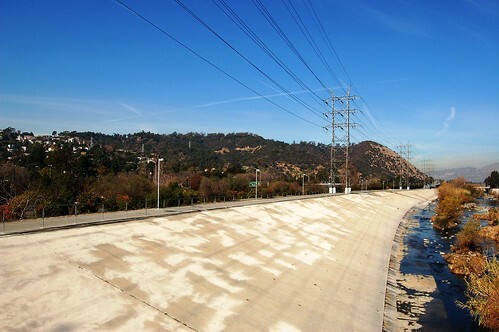 Walk Along the L.A. River: The L.A. River is at its renegade best where Los Feliz Boulevard crosses the 5 in Atwater Village. Here at the Glendale Narrows, cement paths for jogging, walking, biking, and horseback riding line the river’s green expanse. Herons and egrets fish for spawning carp among willows and palms. Access the northern path where the EATZ Cafe abuts the Los Feliz Municipal Golf Course parking lot - and don’t ever again question whether the river is authentic. Yes, we all know the river is authentic. And so is that American cheese on the omelettes at Los Feliz Cafe! (Formerly EATZ Cafe, LA Mag, who's fact-checking?) But who cares, as long as you get breakfast next to a putting green for less than 10 bucks. A neighborhood is on lockdown as a suspect has barricaded himself in a home near Estara and Drew in Atwater Village. Detectives who were doing some undercover work and came across a suspect they were looking for. They say they have one person in custody, but now are asking for the SWAT team for help with a barricaded person. If you are in the area and see any police activity, please stay inside your home. A more than six-hour standoff in Atwater Village ended Wednesday evening when a parolee wanted for failing to report to authorities surrendered without incident... at 7:35 p.m., Los Angeles police Officer Jason Lee said. 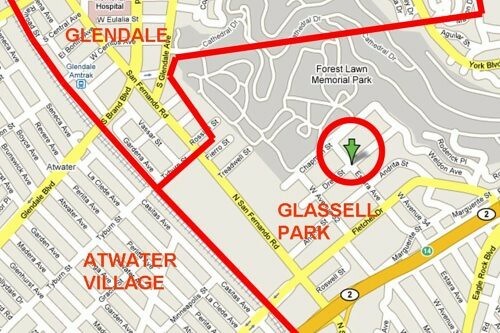 Well done, Glassell Park, passing off your lockdowns and standoffs on Atwater Village. Let's hope they correct it before the next round of crime stats.